This week’s Church feature centers around two people dear to MO: Pete Brissette and Erik Buell. Long time readers will remember Pete for his various escapades under the MO umbrella and his clever approach to jotting them down with (virtual) pen and paper. Buell, of course, needs no introduction, the American motorcycling pioneer staying steadfast in his quest to deliver an American sportbike. 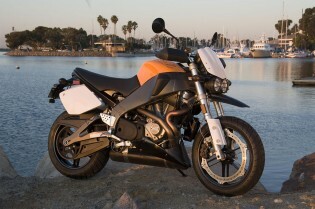 In 2007, however, he introduced what some, including myself, thought would be a fun take on his venerable XB line of Buell motorcycles. With the Buell Lightning Super TT XB12STT, Buell drew inspiration from supermoto and flat track bikes to create what was supposed to be a wicked urban assault vehicle and canyon carver. The bike didn’t quite catch on as well as Buell hoped and only survived for a couple years. Still, Pete was a big fan, and here he reflects on how cool a bike he thought the STT to be. 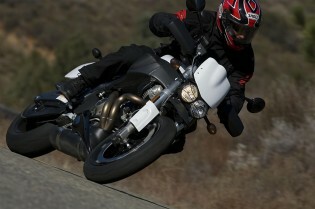 The new Buell Lighting Super TT XB12STT. It doesn’t float. 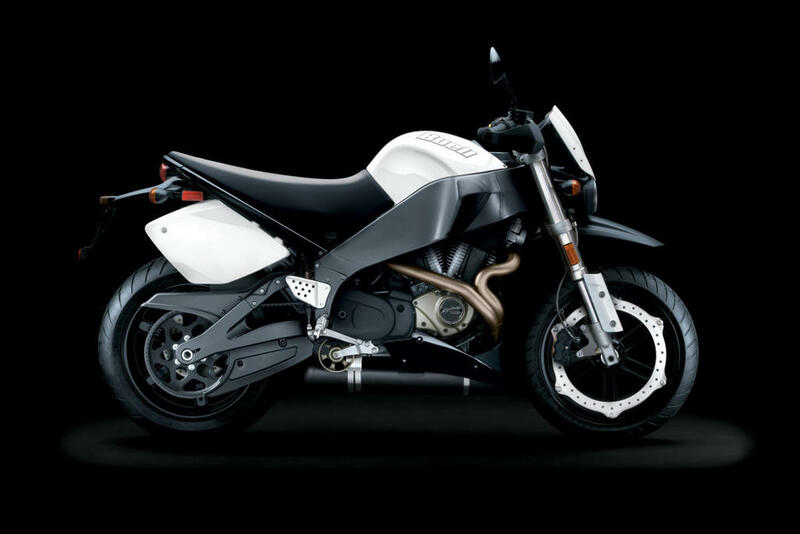 If Erik Buell wasn’t successful as a designer/engineer, innovator, racer and entrepreneur in the motorcycle business, he would be successful at whatever he set his heart, mind and hand on. Sitting in a small conference room for the model/tech briefing of the 2007 Buell Lightning Super TT XB12STT, I found myself quickly drawn to Mr. Buell’s decades-long, unwavering enthusiasm for motorcycles — specifically his own. Erik’s love for what he does and has done comes through in bursts of exuberance at overcoming the challenges of designing a motorcycle, or rather a sportbike, like no other. Part of his elation comes not only in the making of a bike uniquely Buell, but in trouncing the staid attitudes of a jaded media and a circumspect bike-buying public. We learned in mid-summer of last year from Senior Editor Ets-Hokin that, according to Erik, 2007 would be a year of refinement. Coming on as a late addition to Buell’s ’07 line-up, the Lightning XB12STT was initially presented to the world in November, 2006 at the EICMA show in Milan, Italy. 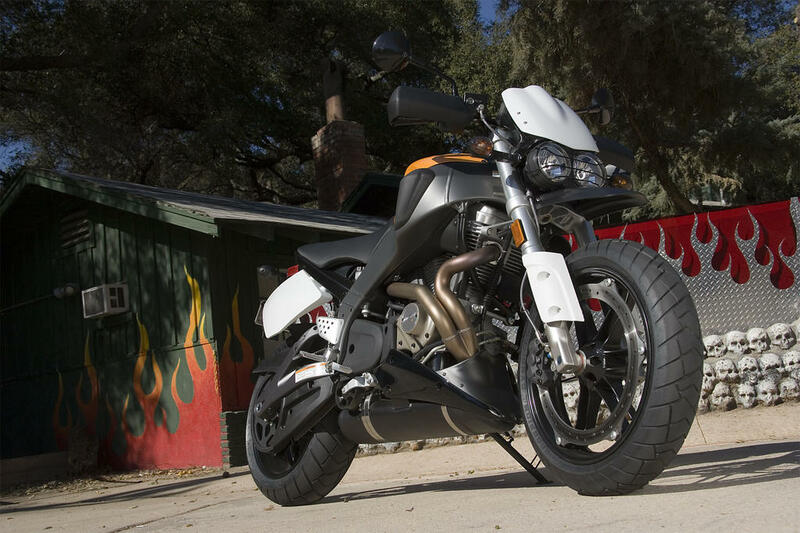 Buell — not necessarily Erik — uses carefully selected catch phrases and enthusiastic analogies, to align the latest Lightning with the aggressive imagery of supermoto and flat track TT. Additionally, they’ve given owners a way to make their XB12STT truly their own by providing an all-white color scheme as a blank canvas to express themselves. The journalist riding this Buell is more than moderately attractive. If your inner rattle can Da Vinci has escaped you, fear not. You can choose from a couple different, shall we say, pre-“urbanized” paint schemes for the faux fuel tank and fly screen. So, does the new Buell fall in line with its brother models and only bring surface treatments to the table; or are the differences more than Surlyn® deep? 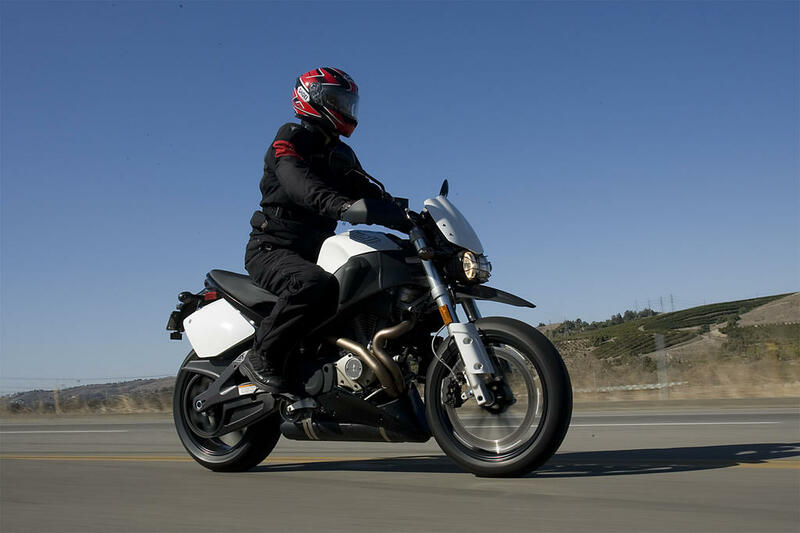 Journos representing most of the American motorcycle publications were beckoned to south Orange County, California by the Buell team to swing a leg over their latest “urban assault” machine and assess all that it offers. During the tech briefing led by none other than the Chief Technical Officer of Buell himself, Erik Buell, the moderately attractive assembly of motorjournalists were refreshed on the technologies of Buell bikes. I say refreshed because the XB12STT is suspiciously similar, a hybrid of types, to most all the models carrying the Lightning namesake. 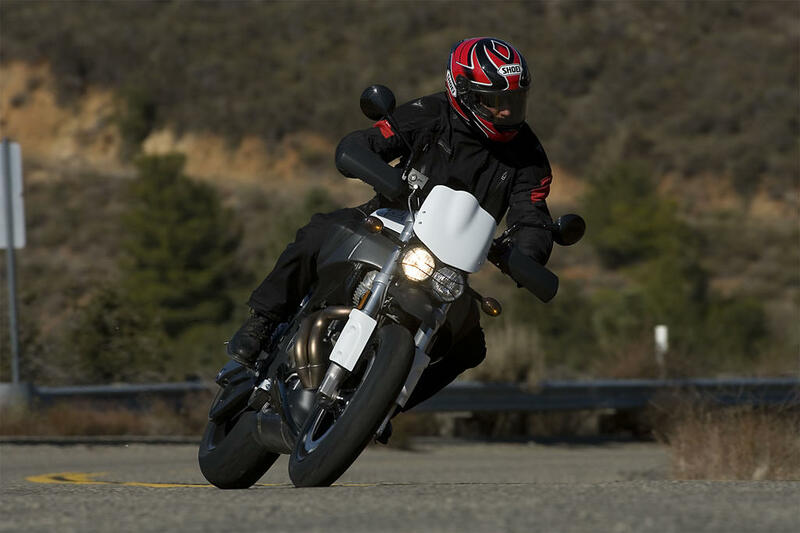 In the event you’re in need of a refreshing yourself as to what makes a Buell, well, a Buell, you can either read the following not-so-succinct version or simply read our earlier reviews from the 2006 and 2007 model-year intros. Still here? Well then, let’s get to the meat. The Super TT — to make it easier on the brain and tongue — has as its backbone the same rigid aluminum, fuel-in-frame twin-spar unit found on all the Lightings; it also has the same swingarm as the Lightning Long. The TT also shares the same torque-a-licious air/oil/fan-cooled Thunderstorm 1203cc OHV 45 degree V-twin producing a claimed 84 ft. lbs of torque and 103 hp that the other Lightnings — save for the CityX which uses a 984cc mill — rely on for mile after mile of tomfoolery. Again, just like its siblings, it has stout, inverted 43mm fully-adjustable Showa forks and a fully adjustable Showa shock. It puts the power to the rear using the same belt final drive, as do all the others. The “Interactive Exhaust System” is right where it always is, at the bottom. Finally, bringing the TT to a stop is the exact same ZTL? 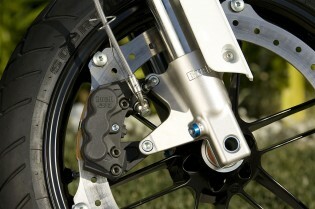 (Zero Torsional Load) brake system that virtually every other Buell model uses. All Buells operate under what Erik calls the Trilogy of Tech: mass centralization, frame rigidity and low unsprung weight. These traits, says Buell, are uniquely Buell, race proven and imitated. 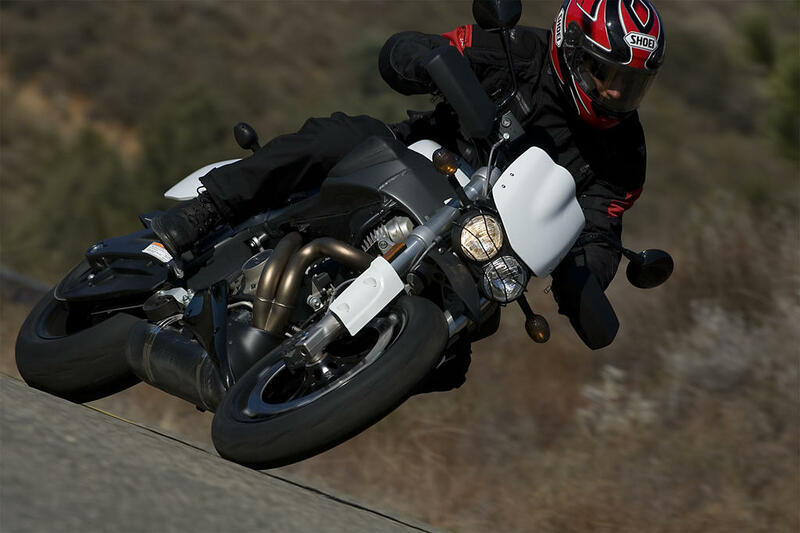 I can certainly agree with the assertion that Buell tech has been imitated..
Dimensionally, the TT is a hair’s breadth from being a dead ringer to the XB12Ss, also known as the Lightning Long. Only a few numbers on the spec sheet separate the TT ever so slightly from the Long. The Super TT is less than half an inch longer than the 12Ss but the braced, motocross style bars on the TT make it just over two and a half inches wider than the 29.7-inch width of the 12Ss. The 23.5 degrees of rake on the 12Ss is marginally softer than the 23.1 degrees on the TT. 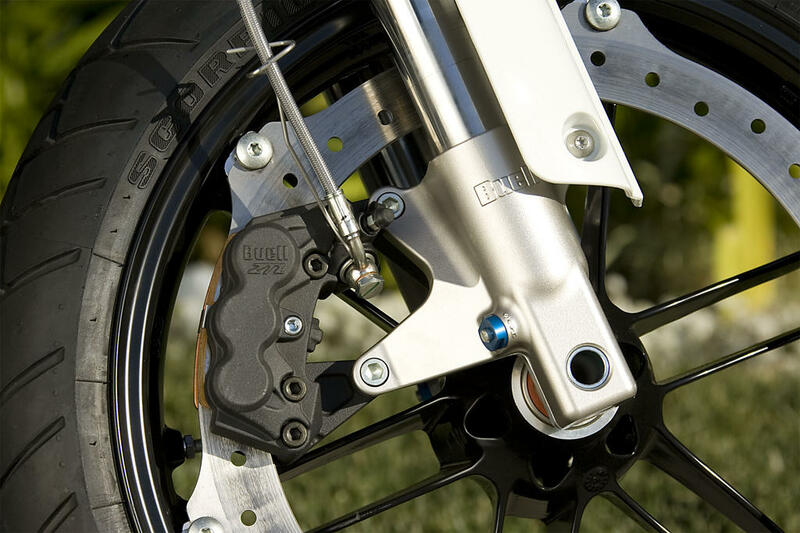 Also, a mere four tenths of a degree separate the 22-degree fork angle on the 12Ss when compared to the TT’s 21.6 degrees. They both have a 54-inch wheelbase and share the same 4.7 inches of trail. On the reasoning behind the slight differences between the two with respect to rake and fork angles, Erik gives the following explanation, “On the Super TT chassis, like on the Ulysses, we have the steering head or frame rake angle more relaxed than the fork tube angle. This does a couple of things: first it gives a more relaxed head angle for rougher roads, and second it gives more trail for stability on unpaved roads. Having the fork angle steeper than the rake allows us to get more suspension compliance, and it allows us to have significantly more trail than the rake angle would suggest, with the bonus of reduced front end inertia.” Sounds sensible enough to this non-engineer bike lover. ZTL. See, it says so right on the caliper. You’d be right to ask such a question with all the indignation you could muster. Yet, a little more attention to detail will expose some key differences. Where the XB12STT sets itself apart from the crowd is in a much more functional arena. For example, the saddle on the TT is styled much more like a dirt bike or supermoto seat than it is any of the other, more sculpted Lightning mounts. It’s long and narrow, which is intended to allow the rider to move around with ease, just like they might on an off-road machine. The seat shares honors with the XB9SX for second-highest height — the Ulysses is tallest, but not by much — rising 31.4 inches above the Earth. While on the subject of bum carriers, it’s also important to note that the Super TT has no passenger accommodations. That’s right, it’s just you, you and more of you. If you really want to expose someone to your riding talents, it’ll cost you an additional $300.90 to get the passenger kit. 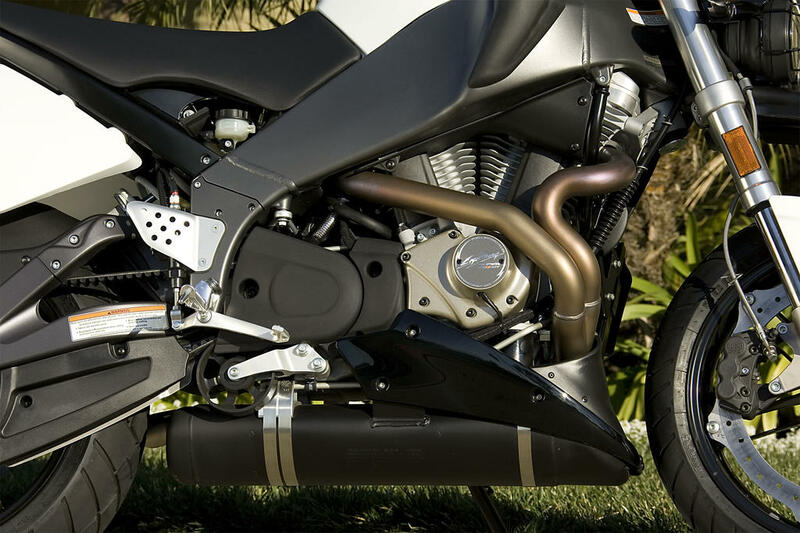 No clearer example of mass centralization exists than the location of a Buell exhaust system. Come to think of it, Gabe’s widening belly is a good example too. Despite being all in the family with 43mm inverted forks, the TT actually has a whopping 5.63 inches of suspension travel, up front and the same travel for the rear. This helps contribute to the substantial ground clearance of 5.5 inches. Again, the Ulysses rules them all in this area, but you already knew that. One last note on the practical side of things: the TT is now one of three bikes in the Lightning line to ride on the Pirelli Scorpion Sync. er…airbox cover. As mentioned above, for a variety of fees you can customize your TT with optional graffiti-style graphics, one piece at a time or as a kit. So, there you have it. That’s the long-winded version of the main differences between the XB12STT and everything else under the sun. You might ask, “But does it ride any different?” Yes. And no. routes, filled with over grown scrub, fallen rocks, cavernous chuck holes and enough loose gravel to disguise any hint of asphalt. And virtually none of it was straight or flat. On more than one occasion I found myself saying, “This is ridiculous!” and then, “This is ridiculous!” but with a completely different tone as the ride wore on. I’ve ridden a few unmaintained National Park fire roads before, but never on a “street bike.” Or at speeds not normally associated with self-preservation. And with relative confidence for that matter. The extra ground clearance and suspension travel on the TT tackled this odd-for-a-street-bike-terrain quite handily, clearing small but sharp rises in the pavement like flat trackers of yore wished they could. Applying my best imitation of someone with substantial supermoto or dirt riding experience, I stuck either foot out as dictated by the turn and shoved the bars down and forward in the same direction. The narrow saddle made this entirely possible and it proved to be one of the defining elements of the XB12STT. Before you start shuddering with discomfort at the thought of long freeway jaunts, relax and breathe easy. It’s plenty supple enough, at least for the rider of average build and it puts you into a more upright riding position, which thankfully doesn’t worsen wind blast at freeway speeds. The Super TT: Another “urban assault” vehicle from your friends at Buell. A small measure of surface street riding came into play, and like all other Buells it was safely at home. Perhaps the moderately more aggressive rake and fork angle help play into the TT’s willingness to wheelie, or what seemed like a willingness to wheelie, at least compared to my memory of the Lightning Long’s relative lack of willingness to do the same. Otherwise, yes, it’s much like the others. It starts easily and fueling to the 49mm down-draft injection system works very well to feed the smooth — if somewhat lumbering — engine. But again, we already know this because we know the other bikes. It also stops with plenty of force and feel with same unique, perimeter mounted rotor that rides on all Buells. Shifting is familiar as is clutch operation: solid and reassuring, light and controlled. Handling is both quick and stable. The Lightning Super TT XB12STT is very much a Buell. That’s a good thing in my opinion. These bikes are, if nothing else, great heaps of fun. On that trait alone they could sell a million of ’em. You have my respect, Erik. 1 Prices may be subject to change without notice and rule as at the date of delivery. See your dealer for details. 2 Unladen, wet configuration (no rider, all fluids). 4 Laden, wet configuration (design rider, all fluids). 5 Bottomed-out configuration (100% suspension compression). 6 Showa®, Dunlop® and Pirelli® are registered trademarks of their respective owners. 7 Based on tests conducted under lab conditions per U.S. E.P.A. test procedures. Mileage will vary depending on personal riding habits, weather conditions, trip length and vehicle condition. 8 Hibrex® and Flexten® are registered trademarks of the Goodyear Tire & Rubber Company. 9 Availability may vary from dealer to dealer, and is subject to change without notice.